Pope Francis met with Salve Kiir and Riech Machar at the Vatican and asking for a real commitment to peace, bowed to the South Sudanese leaders and kissed their feet. These are the thoughts of Don Dante Carraro, Director of Doctors with Africa CUAMM, which has been active in South Sudan since 2006, and currently supports 5 hospitals, 135 peripheral health facilities, and 1 midwifery school, with 70 international workers and 1,300 local workers. “This gesture of Pope Francis was astonishing and revolutionary, bowing before the political leaders of South Sudan who have forced their people into humiliation, poverty, misery, suffering, and pain. Though these leaders are all Christians, some Catholic, some Anglican, they are all involved in a fratricidal conflict that is hurting this new country of South Sudan. 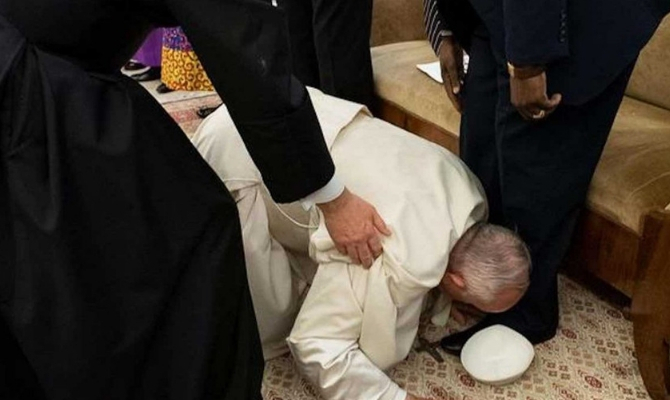 Pope Francis kneeled before them and kissed their feet as if to take on all the suffering, burden, and hardship of the great many people who suffer every day in rural, poor, and abandoned areas of the country. He kneeled and kissed their feet as if laying before them all this suffering and humiliation, imploring them, pleading with them for mercy and peace. His was also a denunciation, the total failure of power that becomes suffering, death, and abuse perpetrated on the lives of the poor. He offers as an alternative of service, vulnerability, and giving of oneself as a gesture that is stronger and more powerful than any other gesture, and than any abuse. Next week is Holy Week. On Thursday, we celebrate foot washing in our churches. The Pope made this gesture that is so important to Christians and turned it from liturgy to life, from symbol to reality, and asked everyone to believe in it, to persevere in service, dedication, and giving. I think of our volunteers in the field, their hardships, when they want to give up, when they are angry. And Pope Francis with his infinite gentleness, with his humble example, who keeps on showing us the way. Without fear, without hesitation: the path of service, the path of giving, the path of being “with” the poor, which is the only way to truly defeat the powerful on this earth.